Just over half of all Hispanic adults in the U.S. worry that they, a family member or a close friend could be deported, a new nationwide survey of Latinos by the Pew Hispanic Center has found. Nearly two-thirds say the failure of Congress to enact an immigration reform bill has made life more difficult for all Latinos. Smaller numbers (ranging from about one-in-eight to one-in-four) say the heightened attention to immigration issues has had a specific negative effect on them personally. These effects include more difficulty finding work or housing; less likelihood of using government services or traveling abroad; and more likelihood of being asked to produce documents to prove their immigration status. However, when respondents were asked about changes in the overall situation of Latinos in this country in the past year, no consensus view emerged. About one-in-three say things have gotten worse, about one-in-four say things have gotten better, and about four-in-ten say there has been no change. Despite their concerns about the impact of the immigration debate, Hispanics are generally content with their own lives and upbeat about the long-term prospects for Latino children. Nearly eight-in-ten respondents, for example, say they are very (45%) or somewhat (33%) confident that Hispanic children growing up now will have better jobs and more money than they have. Hispanics are the nation’s largest minority group, numbering 47 million (about 15.5% of the total U.S. population). About a quarter of Hispanic adults are unauthorized immigrants, most of them arriving as part of a heavy wave of immigration that began gathering force in the 1970s.1 Twice in the past two years, the U.S. Congress tried but failed to pass comprehensive legislation to deal with the problem of illegal immigration. However, federal, state and local governments have pressed forward with hundreds of new enforcement bills, regulations and procedures—including stepped-up deportations, more workplace raids, and restrictions on access to driver’s licenses and other government services and benefits. (A summary of key trends in enforcement begins on page 6). In addition to this wide variance in views between Hispanics and non-Hispanics, the survey finds less pronounced—but still significant—gaps within the Hispanic community on a range of matters, from perceptions about discrimination to attitudes about illegal immigration to support for tougher enforcement measures. For example, on questions about enforcement policies, native-born Hispanics take positions that are closer to those of the rest of the U.S. population than do foreign-born Hispanics. Also, the native born are less likely than the foreign born to report a negative personal impact from the heightened attention to immigration issues. Likewise, Hispanics who are not citizens feel much more vulnerable in the current environment than do Hispanics who are citizens. They are about twice as likely as Hispanic citizens to worry about deportation and to feel a specific negative personal impact from the heightened attention to illegal immigration. (Non-citizens account for 44% of the total adult Hispanic population. Of these non-citizen Latino adults, an estimated 55% are undocumented immigrants and the other 45% are legal aliens). Hispanics also have widely varying assessments about the amount of attention that local officials and political leaders in their communities are paying to the issue of illegal immigration. A third say a lot, but four-in-ten say not too much, and one-in-five say none at all. These variances likely reflect the reality that immigration has become a politically heated local issue in some parts of the country but not in others. Whatever new vulnerability Hispanics feel in the present political and policy environment, the survey finds little evidence of a backlash against illegal immigration by Hispanics themselves. To the contrary, Hispanics generally see illegal immigrants as a plus – both for the Latino community itself and for the U.S. economy in general. Here, too, there are differences by nativity – with the foreign born significantly more positive than the native born in their views about the effects of illegal immigration. But even the native born are more positive than negative. And, as they assess the impact of illegal immigrants on the economy, native-born Latinos are more inclined to see a positive impact now (64%) than they were five years ago, when just 54% said the impact was positive. More than half of all Hispanic adults say they worry a lot (33%) or some (20%) that they, a family member or a close friend could be deported. This anxiety is particularly widespread among foreign-born Hispanics, who make up just over half of all Hispanic adults. 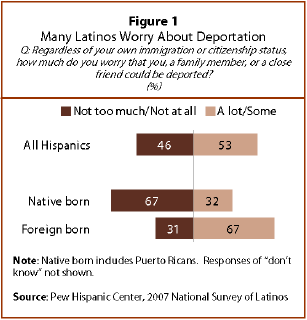 Fully two-thirds of this group say they worry a lot (43%) or some (24%) about deportation. But even among native-born Latinos—all of whom are citizens—there is significant anxiety. Nearly a third of this group says they worry a lot (18%) or some (14%) that they, a family member or close friend could be deported. Among this group, the worries are presumably centered on family and friends. Hispanics have a generally positive view of illegal immigrants. Half (50%) say that the growing number of undocumented or illegal immigrants has had a positive impact on Hispanics living here. Just one-in-five say illegal immigrants have had a negative impact, and the rest either say there has been no impact or they don’t have an opinion. Three-quarters of Hispanics say illegal immigrants help the U.S. economy by providing low-cost labor, while just 17% say they hurt the economy by driving wages down. Non-Hispanics, by contrast, tend to see the negative: some 48% say illegal immigrants hurt the economy, while just 40% say they help it. There’s a wide gap between Hispanics and non-Hispanics on attitudes toward three enforcement measures tested in this survey. Some 51% of non-Hispanics approve of workplace raids to discourage employers from hiring illegal immigrants; just 20% of Hispanics agree. Some 85% of non-Hispanics approve of states checking immigration status before issuing driver’s licenses; just 40% of Hispanics agree. Some 45% of non-Hispanics approve of local police taking an active role in identifying illegal immigrants; just 14% of Hispanics agree. Two-thirds of Hispanics (64%) say the debate over immigration policy and the failure of Congress to enact an immigration reform bill have made life more difficult for Latinos living in this country. Foreign-born Hispanics are more inclined to feel this way (72%) than are the native born (53%). Roughly half of all Hispanics report that the increased public attention to immigration issues has negatively impacted their lives in one or more specific ways. Some 12% say they have had more trouble getting or keeping a job; 15% say they have had more trouble finding or keeping housing; 19% say they have been asked to produce documents to prove their immigration status more often than in the past; 22% say they are less likely to use government services; and 24% say they are less likely to travel abroad. When asked to look back over a longer time period, some four-in-ten Hispanic (41%) respondents say they, a family member or a close friend had experienced discrimination in the past five years. When the same question was posed in a 2002 survey, just 31% responded that they or someone close to them had had a personal experience with discrimination; in 2006, 38% said this. More than half of Latinos (54%) say discrimination is a major problem that is keeping Latinos from succeeding in this country, and a quarter (24%) say it is a minor problem. This perception has grown since 2002, when 44% called discrimination a major problem, but declined slightly since 2006, when 58% said the same thing. Asked to choose among four possible causes of discrimination against Hispanics, nearly half (46%) of all respondents say language is the biggest cause; 22% say immigration status; 16% say income and education; and 11% say skin color. About seven-in-ten Hispanics describe their quality of life as excellent (26%) or good (45%). Also, 78% of respondents say they are very or somewhat confident that Latino children growing up now in the U.S. will have better jobs and make more money than they themselves have. The terms “unauthorized immigrants”, “undocumented immigrants” and “illegal immigrants” are also used interchangeably. Native-born persons include those born in Puerto Rico. Citizens include citizens by birth and naturalization. Percents may not total 100 due to rounding or the omission of don’t know/refused responses. 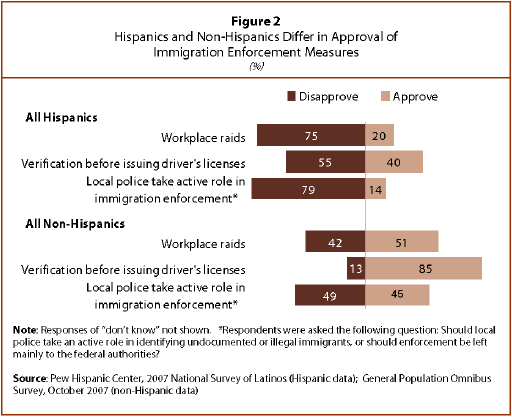 The 2007 National Survey of Latinos focuses on Hispanics’ views on the immigration debate and immigration enforcement, attitudes towards illegal immigrants, and perceptions of discrimination. The survey was conducted by telephone from October 3 through November 9, 2007 among a randomly-selected, nationally-representative sample of 2,003 Hispanic adults (with a margin of error of plus/minus 2.7%). Contributors to the report include April Clark, D’Vera Cohn, Richard Fry, Cary Funk, Felisa Gonzales, Rakesh Kochhar, Gretchen Livingston, Jeffrey Passel and Paul Taylor.